Monster Energy Yamaha Factory Racing Team riders Jeremy Van Horebeek and Romain Febvre, and Wilvo Yamaha Official MXGP’s Shaun Simpson and Jeremy Seewer are all set for the second stop, of nineteen, on the 2018 FIM MXGP World Championship calendar with the series moving to the familiar sand of Valkenswaard, The Netherlands this weekend, March 17th and 18th. Situated next to the Eurocircuit road course, between Eindhoven and the Belgian boarder, Valkenswaard will mark the first of the sand races on the 2018 calendar. Renowned for its popularity and hugely animated crowds, which are bolstered by the influx of ever passionate and crazy Belgian motocross fans who cross the border, there is expected to be a lot of support for Monster Energy Yamaha Factory Racing’s own Belgian star Jeremy Van Horebeek, particularly after his stellar podium performance at this venue last year. Van Horebeek is currently 4th in the MXGP Championship Standings tied on 34 points with his Monster Energy Yamaha Factory Racing Teammate Romain Febvre. Febvre, who has spent the best part of 5-years based in Belgium, has proven his ability to navigate his way around a choppy sand track on a number of occasions. He stood on the second step of the podium at the MX2 Grand Prix of The Netherlands in Valkenswaard back in 2014, and then went on to win the MXGP of Europe at the same track inside the premier class in 2016. Wilvo Yamaha Official MXGP’s Shaun Simpson is one name that resounds in the minds of those that admire riders with serious skill in the sand. The Brit, who turned 30-years-old on Tuesday 13th March, has won two Grands Prix on Dutch soil inside the MXGP class. He will be looking to add some solid points to the 24 his gained in Argentina, and improve on his 7th place finish. As for his Swiss teammate, Jeremy Seewer will be bouncing back from a hard fall in Race 2 two weeks ago. Fortunately, the 23-year-old was shaken, but unharmed and will be back on the gate and ready to build on his experience inside the premier class this weekend. Running in conjunction with the MXGP World Championship, Yamaha will have a full line-up in MX2. 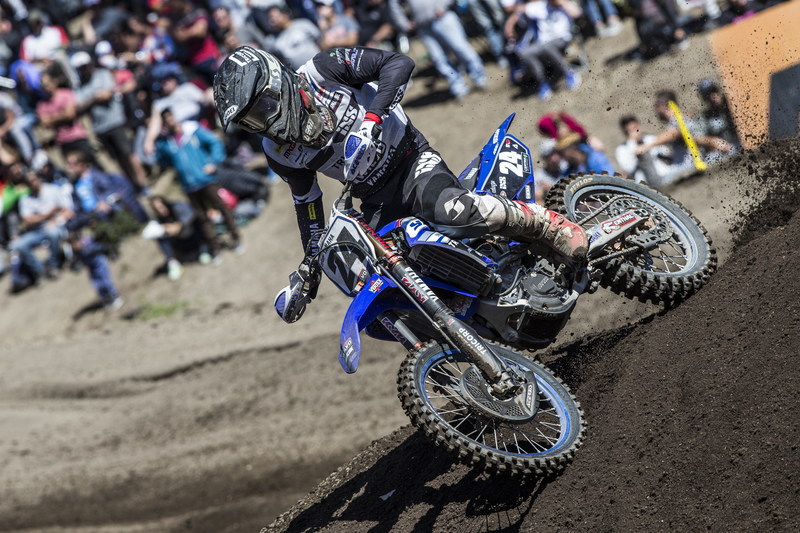 Kemea Yamaha Official MX2’s Ben Watson is another Brit that is typically quick in the sand. He finished a tantalizing 1-point shy of his first ever podium at the MXGP of Argentina and could be in line to reach that milestone this weekend. Teammate Jago Geerts lives less than 40 minutes from the circuit and could be the cat among the pigeons, while Vsevelod Brylyakov is hoping to put in a pair of strong, yet consistent rides. SM Action Mc Migliori Yamaha Racing has armed the extremely gifted Maxime Renaux with a YZ250F to wildcard the MX2 class this weekend, alongside permanent teammates Alvin Östlund and Alessandro Manucci. In addition to the MXGP and MX2 classes, the first round of the European Championship EMX125 series will take place with MJC Yamaha Official EMX125 Team lining up two of their three riders, since young Dutchman Rick Elzinga is still recovering from an injury that saw him break both arms one month ago. Flying the flag, French ace Thibault Benistant will take his GYTR kitted YZ125 to the line, along side teammate and winner of the YZ125 bLU cRU Cup, Estonia’s Jörgen-Matthias Talviku.